How are flesh eating bacteria and global warming related? Please read this article to find out more....This is one scary disease. And what if it increases as it seems to be doing? I know I have concerns as all of us should...thanks for your NOTES, Comments (ahead of time) and for sharing w/others. There is nothing to worry about if you know about natural methods of healing. Drug based methods only make everything worse. Doctors and hospitals are mainly where one gets these infections. If you do not want to get infected with superbugs, stay away from hospitals where antibiotics are making bad bugs MUCH WORSE. Also, stop eating meat from global corporate meat farms, where antibiotics also breed SUPERBUGS. If you must eat meat, buy organic or raise it yourself. We are destroying ourselves. We do not need terrorists to do it to us... That is the message of flesh eating bacteria... They are only the messengers, not the problem. WE are the problem. WE must solve it. 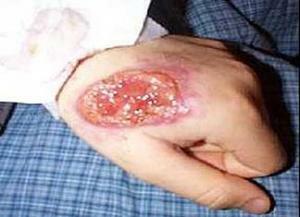 Leishmaniasis is a one celled protozoan parasite normally contracted from the bite of a sandfly. There is no sterile cure for it. It is transmitted sexually, congenitally, and by blood transfusion. It can live in stored blood for a month. It can take twenty years to present symptoms in an otherwise healthy person. Thousands of soldiers have been infected in Iraq and Afghanistan. Thousands of Contractors have contraced this though most of them aren't aware of what it is because they get no medical attention like the soldiers do. There is a ban on blood donations for one year for people who have travelled to Iraq or Afghanistan but it should be much longer than a year. They know this but it would worsen the blood shortages. Most people who were infected this way would never realize it. Eric I'm curious what the natural methods of healing would be for something like this. Do you have info? I have read that some people poured clorox over in the infected area to stop it( Please do not do this!). I believe I really need to learn more about this type of bacteria. It so scary and can cause so much damage to your body and kill you. Thank goodness I am allergic to red meat! and Lamb! Yes, what is the herbal atidonte for this? how can one protect themselves from this and if they get it, what is the first thing to do???? My dearest stepfather died from this horrible disease! We had gone to visit his sister in Northern Michigan and I noticed he had a bad wound on his arm apparently from his dog. I immediately started putting Neosporin on it, but by the next day he was so sick (bad flu like symptoms). Then he started feeling better and ate a big meal I had cooked. We told him he should go to the nearest hospital, but he was sooooo stubborn. He said he would when he got home. On the trip home which was about six hours, his kidneys were shuting down and he was in such terrible pain with his leg swelling up. But he insisted on being home. I so wish we had not of followed his wish to get home now. So as soon as we got him home we called an ambulance and they rushed him to the hospital. It took about 2 days for them to discover it was the Streph type A bacteria (Flesh Eating Bacteria). In the first days he developed a large ulcer type area on his upper leg that he had knee replacement surgery a few years before. They were pumping him full of antibiotics, put him on dialysis, but it wasn't working. Then the when the doctors told us what he had we were totally in shock. They said if they amputated his leg above the knee he had replaced he may have a chance. So we agreed and they kept him totally sedated after the surgery. Within a few days, on Friday September 13th, 1996 he was gone! We didn't even get to say our goodbyes and tell him how much we love him. The doctors told us that the bacteria will usually attack the weak spot in the body which was his knee replacement. Also, we were told this type of Streph bacteria is in the air, on our bodys and it is the same strain that causes streph throat. Some people are just more prone to contractring it in the severe form. I hope this story will encourage you to take care of any cuts with some form of antibiotic cream early on before the cut gets any worse. Susie I hate to say this but rushing your stepdad to the hospital most likely killed him, what do you think the M.R. in M.R.S.A. stand's for, Methicillin Resistant Staphylococcus Aureus, meaning antibiotic resistant, most of these bug's are the same, the best product on the market today is Super silver it's the best natural antibiotic on the planet, I'm sure your stepdad would stiil be alive today if you'd known, Eric is right about doctors and hospitals you need to stay away from them as much as possible, and in a by word these bugs are being spread by chemtrail's the same as morgellons disease, theres a woman on youtube that cured her Morgellons with Super silver, and if you dont believe me or you don't know what chemtrail's are do some research on them, It's got nothing to do with the global warming hype. Blaming global warming for a parasite being spead as the result of war is typical of the Orwellian news we keep getting. "Should global warming continue to ravage our planet at current rates," well. GW is NOT "ravaging our planet", the Arctic is experiencing a periodic warming...that's all...the rest is scam. "Arctic Ocean Getting Warm; Seals Vanish and Icebergs Melt" --Washington Post headline, November 2, 1922. The greatest cause of "Flesh Eating Disease" is twofold, 1) improper sanitation methods and 2) the overuse of antibiotics. We get antibiotics dumped into our system in everything from milk to dishsoap and there's absolutely no reason for it except big businesses' so called "bottom line." Fear is a wonderful marketing tool unfortunately. The more antibiotics used and in your system the more bacteria builds immunity and the less our own body's immunity system is able to function- we're at a tipping point and if we as consumers don't stand up and say STOP, by purchasing products that aren't full of antibiotics, eventually, as they are finding out even now, antibiotics such as amoxicillian etc. will cease to work. The result is stronger and/or more antibiotics needed until even they stop working. We and only we can stop this kind of insidious bacterial disease from becoming the "norm." Laurie, can you tell me WHO these experts are that released the microbes into these different areas and why did they do it? I don't understand that part of it. What would be the purpose of releasing this kind of scrouge on people? And could you explain "bioremediation." I'm not familiar with it. Thanks. Merrie, I agree that we humans have brought a lot of the problem upon ourselves with too many antibiotics prescribed for everything, including viruses against which they are useless, and our obssession with killing germs so that we are more susceptible than ever to new mutations. So now we have stronger bacteria and fewer antibiotics to deal with these superbugs. Good comments! Thanks. Jennie I can tell you the experts, it happens to be W.H.O. the World Health Organisation linked with the U.N. are signed sealed and delivered to cull 6 billion people off the face of this planet, and then enslave the rest of us,however hard that is to swollow I'm afraid it's true,the main way they will pull it off is with vaccination's, this whole bird flu hype is rubbish, there's no such thing as human bird flu, but come this winter they'll be saying, "Quick there's an avian flu pandemic coming rush down to your doctor and get your jab" and it,s the jab that's going to kill you not avian bird flu, and the gov will say "Yes I'm afraid this is going to be compulsory this is a public health alert" and if you think Hillary Rotton Clinton is going to save us all she's signed sealed as well, she even wrote it down in one of her books, just like Prince Phillip who was asked in the book, [ If I were an animal ] what he would like to come back as when he died to help planet earth he said "He'd like to come back as a virus and wipe out all of the people on the planet" this is the kind of mindset we are all up against here, if Hillary get's in, 6 billion people on this planet are doomed, and I know I'm souding a bit like Fraiser in Dad's Army here and this is getting like an Alex Jones rant but this is how someone sound's when they'v woken up to the awfull truth,you people should stop eating meat get a berkey water filter so you'v got your own source of fresh drinking water when they turn it off or put poison in the system, buy wheat grass seed's and a hand juicer and grow wheat grass, juice it and drink that, its been called the food of the god's and in an emergency you can live off of it, we all need to get our immune systems as strong as we can because they'v been spraying us all with Chemtrails for 20 year's to drive us to the point of death, most of you are only one vaccination away from your grave's, and I know these thing's because I'v researched them, that's all I do 8 hours a day, I'v been researching alternative therapies for 30 or more year's, I'v thrown away more therapies than most people know,ok I'v just about ranted on enough, but go and do some research yourself before they pull the plug on all of us. catch up later. I appreciate all of the info posted by so many of you. Thank you! I am rather confused by some of the comments above, which would indicate that some have not read/understood the article. There are three forms of Leishmaniasis (Visceral, Cutaneous, and Mucotaneous), and it is caused by the bite of the sandfly introducing parasites (of various species) into the human hosts. The untreated Visceral form is usually fatal within 2 years, in 70% of cases. It is NOT treatable with antobiotics, but with chemotherapeutic agents, such as sodium stibogluconate, allupurinol, and ketoconazole. The Cutaneous form may also respond to topical application of paromomycin. Hopefully the research at Hull University will be successful, and a further weapon against Leishmaniasis will be perfected. Cary: What the hell has your comment to do with anything, let alone Leishmaniasis? By your own admission, "I'v thrown away more therapies than most people know", you must suffer from more than your fair share of illnesses, perhaps it is time for you to see a competent MD!